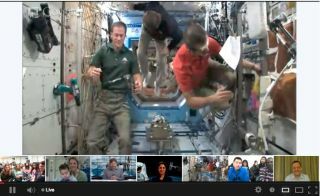 Astronauts (L to R) Marshburn, Ford and Hadfield float free aboard the International Space Station at the conclusion of the Google+ Hangout on Feb. 22, 2013. Thousands of space fans young and old got a taste of what life in space is like Friday (Feb. 22) during NASA's first-ever Google+ Hangout with astronauts on the International Space Station. The live online video conference connected three members of the space station's crew with chat participants from around the world and came just days after the $100 billion space laboratory briefly lost communications with NASA Mission Control. "The space station is a robust, tough space ship," Canadian Space Agency astronaut Chris Hadfield said when asked about the communications malfunction. "We worked together as a crew following the procedures as we're trained to do. After just a couple orbits, we had the computers talking to the antennas properly so we could talk to the ground. We were working together as a team." Two students from Union High School in Iowa asked the astronauts to explain why space agencies around the world have people living in space. "The whole point of having a space station is to have some place in space where people can take their ideas," Ford responded. "We have a huge power supply up here. We have a lot of rack space, and we have a lot of scientists on the ground with a lot of ideas of things to do in space." Other questions focused on the health of the astronauts. Space station astronauts are expected to monitor their health very closely to see how the body changes when exposed to microgravity. Hadfield was in the middle of one of those health experiments today. Marshburn — a medical doctor — explained that two non-invasive temperature probes attached to Hadfield's head and chest allow the scientists see how his natural body cycles have changed since being in orbit. Because the space station experiences 16 sunsets and as many sunrises in any given day, the circadian rhythms of station astronauts tend to change a great deal while in orbit, the astronauts said. Hadfield's temperature-monitoring probe will help doctors keep track of just how much those change. The space station residents have contingency plans for medical emergencies too. A group of students from the Neil Armstrong Institute in Monterrey, Mexico asked the spaceflyers what would happen if one of their colleagues fell ill while in space. Marshburn explained that there are always two medical officers as part of the six person crew. The designated residents are trained to perform medical procedures that will stabilize the injured spaceflyer until he or she can be sent back to Earth using the Russian Soyuz capsule that brought them to the station. The question and answer session with the space station lasted about 20 minutes, but NASA astronauts on the ground Nicole Stott and Ron Garan fielded questions from the audience for the other 40 minutes. Hadfield, Ford and Marshburn make up half of the Expedition 34 crew currently living on the International Space Station. Three Russian cosmonauts round out the crew. The International Space Station is the largest structure ever built in space. It is the size of a football field and was constructed by 15 different countries working under five space agencies representing the United States, Russia, Europe, Canada and Japan. Construction of the space station began in 1998 and it has been continuously staffed by international astronaut crews working on a rotating mission schedule since 2000. NASA also provides live video from the International Space Station via Ustream, as well as live audio from the space station.